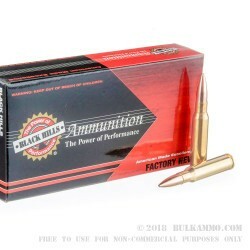 Black Hills Ammo is one of the heavy hitting juggernauts in the world of .308 ammunition. They have a solid reputation for accuracy, dependability, and repeatability in adverse conditions. They are used by multiple militaries and special forces units all over the USA. 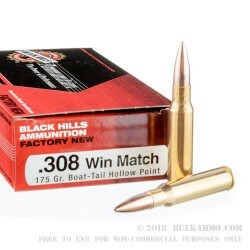 The Black Hills .308 Winchester BTHP or Boat Tail Hollow Point cartridge is loaded with the thick copper wrapped, 175 grain Sierra Match King bullet. 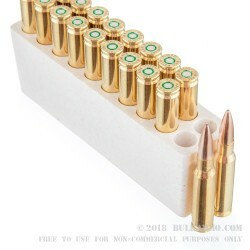 Each bullet is loaded into a heavy duty, new, thick walled, reloadable, Boxer primed non-corrosive, brass case. These rounds have a muzzle energy of 2,681-foot pounds, and their muzzle velocity is 2,627-feet per second. The 20 round boxes they come in are great for stocking up on or taking on the hunt. And they are priced perfectly so you can buy multiple boxes for your next shooting competition. Get some now. 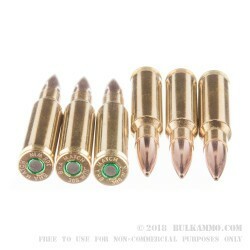 Since first hitting the scene in 1952, the .308 Win round has gone far past many other cartridges in bullet type, weight, and the overall variable configurations available for the popular .30 caliber. Traditionally used for hunting elk, deer, and larger North American game, the .308 Winchester is far and away the most popular load in the rifle cartridge world. With its popularity being owed to its versatility and multi-role adaptability within the military and civilian worlds.